We’re pleased to announce the publication of WaveTrack’s mid-year video update of medium-term forecasts for COMMODITIES! 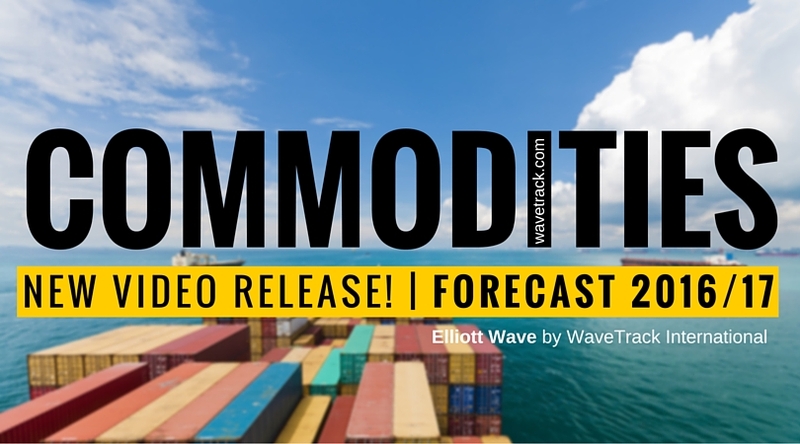 Back in January this year, WaveTrack International’s annual 2016 Elliott Wave Commodity forecasts forewarned of an imminent and major low being approached for all of the main sectors, Base Metals, Precious Metals and Energy/Crude Oil contracts. It didn’t take long for this to be realised! Led slightly earlier by Precious Metals, Gold and Silver bottomed the previous month, in December, closely followed by double-bottom activity in Crude and Brent Oil – Base Metals also responded in major reversals although less enthusiastic in their subsequent advances. Gold has since traded higher by +24% per cent, silver by +32% per cent, Crude Oil by a massive 92% per cent and copper so far lagging but higher by +18% per cent. Some of the commodity equities we identified as big buying opportunities, especially those for precious metals came good with Newmont Mining up by a massive +194% per cent! Precious and Base metals have since given back some of those initial gains but the BIG MESSAGE derived from these initial movements is this – we can expect even higher levels during the next several years. 1 hour 45 mins long video of indepth Elliott Wave commentary featuring over 50 charts! Correlation analysis, highlighting Commodity Resurgence! In this video Peter discusses the various intricacies revealed by his correlation studies to forecast yet another supporting strong evidence of a Commodity Resurgence. Since then, Newmont Mining has traded higher by an amazing +108% per cent! Each video runs for at least 1 hour 20 minutes and it’s packed with SPECIFIC Elliott Wave price-forecasts. BONUS! Each of the 40+ charts illustrated in the VIDEOS will be created into a .pdf document/report and sent to you so that you can always keep these to refer to! PART III will be available in a few weeks’ time – we’re working on it! This is the most insightful and precise Elliott Wave financial forecast available.